English uses the Roman alphabet, which was originally used to write Latin. Today, this alphabet is used in almost all European languages. English uses 26 letters and is written left to right. For about 380 million people English is a native language, because they learned it when they were young children. However, possibly a billion people have learned the language as adults. Overall, only Mandarin Chinese is spoken by more people as a native language. English is widely considered the lingua franca of the diplomatic, business and scientific worlds. lingua franca — a common language spoken by people whose native languages are different. 1500 years ago, the English language as we know it today did not exist. Tribes of warriors living in what is now Northern Germany spoke a language called Anglo-Saxon. This language is related to German. While many words in this language are similar to words in modern English, it is not possible to understand the language without intensive study. After the Romans left Britain in 400 AD, these German warriors crossed the North Sea to pillage the cities that the Romans had abandoned. Finding the country to their liking, they stayed and settled down as farmers. Around 600 AD, the Anglo-Saxons were converted to Christianity. As a result, they adopted many Latin words into their language because Latin was the language used by the Church. Words like ‘bishop’, ‘mass’ and ‘angel’ all entered the language at this time. Between 800 AD and 1000 AD, England was invaded by the Vikings several times. The Vikings were tradesmen and warriors who came to England on long-ships. They spoke Norse, a language which is closely related to Danish and Norwegian. As the Vikings settled in the north and east of England, they soon began living peacefully with the English rather than fighting with them. Thus the English learnt many Norse words. Many everyday words in English, such as ‘cake’, ‘sister’, ‘skin’, ‘horse’ and ‘knife’ were actually borrowed from the Vikings. In 1066, England was invaded by William the Conqueror, who came from Normandy and spoke Norman French. William became the King of England but could not speak English. Soon, government and trade in England were being conducted in Norman French. Words such as ‘merchant’, ‘money’ and ‘price’ — which were all borrowed from Norman French — show how much the invaders controlled business; words such as ‘castle’, ‘law’, ‘royal’, ‘prince’, and ‘government’ show how much authority the French speakers had. In the 15th Century, the printing press was invented. At the same time, people across Europe became more and more interested in the discoveries of ancient philosophers and scientists, and learned Latin and Greek in order to be able to read what these people had written. Soon people were showing off their education by mixing Latin and Greek into their English speech, so that Latin words like ‘manuscript’ and ‘circumference’ were being used, as were Greek words like ‘encyclopedia’ and ‘philosophical’. Around 1600, William Shakespeare was writing his plays. This was a time when many new words entered the language. Shakespeare alone was the first person to write ‘obscene’, ‘accommodation’, and ‘leap-frog’. He also invented many other words. In the 1600s and 1700s, England developed an overseas empire. The English language spread to America and Canada in the 17th century when English settlers traveled there to set up farms, and to Australia in the 18th and 19th centuries when English prisoners were sent there. In the 19th century, the language also arrived in New Zealand and began to be used in British colonies and territories in the West Indies, Africa, India and the Far East – including Hong Kong. As well as spreading overseas, the English language found itself being enriched by its contacts with other cultures at this time, borrowing many words from other languages such as ‘wigwam’, ‘racoon’, and ‘skunk’ from American Indians, ‘curry’, ‘bungalow’, and ‘pyjamas’, ‘juggernaut’, ‘bandicoot’ from India, and even ‘rickshaw’ and the expression ‘long time no see’ from Cantonese. With the global dominance of American culture in the 20th century, the influence of English continued to expand and the English vocabulary continued to grow. Words like ‘movie’, ‘hamburger’ and ‘TV dinner’ all reflect the global influence of American popular culture. More recently, the appearance of words like ‘blog’ and ‘cyberspace’, ‘text’ used as a verb, and ‘mobile’ used as a noun shows how technology is influencing the development of the language at the beginning of the 21st century. The oldest form of English is called Old English, or Anglo-Saxon. Old English sounds and looks very different from the English spoken today and for the most part is not understandable by speakers of Modern English. Old English later became Middle English which is much more like Modern English. In the 1500s, William Shakespeare played a large part in the creation of modern English. Both Shakespeare and Chaucer wrote in the English vernacular. Before them, most important works were written in Latin, or sometimes French. Latin was considered a professional language that scholars used. Chaucer and Shakespeare were some of the first to write important stories in English. 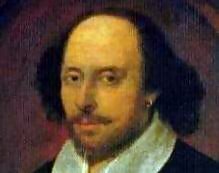 William Shakespeare was a playwright and poet. William Shakespeare, who wrote in verse, is the author of dozens of plays and over a hundred sonnets. Many popular English prose authors, such as Mary Shelley, the author of Frankenstein, Jane Austen, the author of Pride and Prejudice, and Charles Dickens, the author of A Tale of Two Cities, come from the Romantic and Victorian eras, which were during the 1800s. verse — writing in poetic form; not writing in sentences. One of the most popular writers of English fiction for children was Enid Blyton. She is noted for series of books based on recurring characters. Her most widely known character is thought to be Noddy. Her books have enjoyed popular success in many parts of the world, and have exceeded sales of 400 million. In 2006, Blyton was the fifth most popular author in the world. There have been more than 3300 translations of her works. "Vernacular." Wikipedia, The Free Encyclopedia. 15 Mar 2006, 17:30 UTC. 2 Apr 2006, 12:49 <http://en.wikipedia.org/w/index.php?title=Vernacular&oldid=43916157>. "English language." Wikipedia, The Free Encyclopedia. 2 Apr 2006, 10:53 UTC. 2 Apr 2006, 12:50 <http://en.wikipedia.org/w/index.php?title=English_language&oldid=46580990>. "English literature." Wikipedia, The Free Encyclopedia. 30 Mar 2006, 16:53 UTC. 2 Apr 2006, 12:50 <http://en.wikipedia.org/w/index.php?title=English_literature&oldid=46184672>.